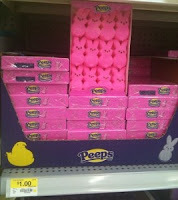 Easter Peeps only $0.50 w/ Coupon! Head over to the Peeps Facebook page to get a $0.50 coupon. Bring it to Walmart to super cheap Peeps!